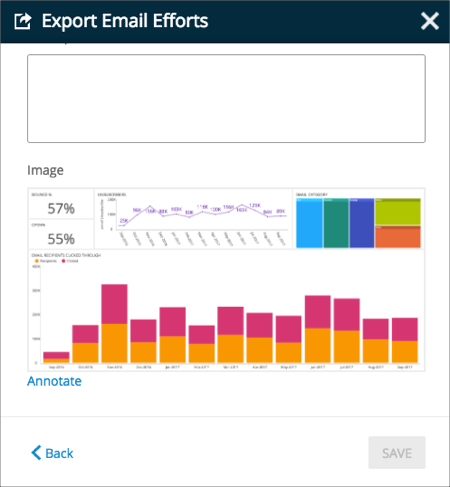 The information displayed in dashboards will change over time as the data changes in the data source, but there will be scenarios where you will benefit from sharing a snapshot of the data in that specific moment in time. For instance to highlight an unexpected value, that may provide some business insight and requires attention right away. Also the dashboard format which allows to pack a lot of information in a single view may not be the best format to provide a more detailed, and corporate branded, walk through and discussion around the information upon sharing. 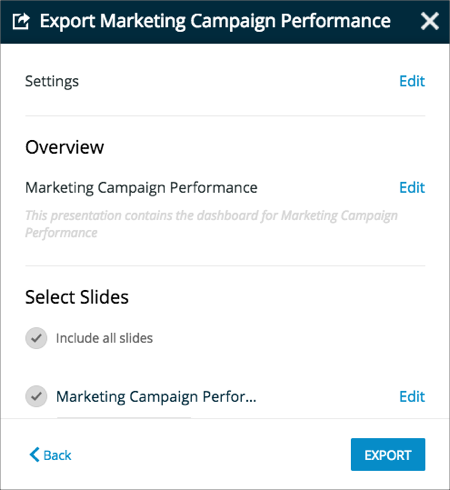 In order to access the export feature, you must navigate to the dashboard and then click the "Export" button in the top-right corner. Export an Image. Download a screen capture of the dashboard. Export a .RPLUS file. Download a copy of the dashboard to your local drive. Export a CSV. Download a collector of CSV (Comma Separated Values) files containing the information displayed in each widget in a raw format. It is suitable for sharing only the data retrieved by ReportPlus from the original data sources. Export a Power Point Slide Deck. Download a Power Point file with your widgets. You can add a description of each widget if necessary. Export a PDF. Download a PDF file with your widgets. You can add a descriptionof each widget if necessary. Export to a Word document. A Microsoft Word document with a similar structure as the PDF export, but which enables collaboration with other teammates to keep developing the document with changes. Author Names: Name that will be used in the generation of the report as author of the document. This entry is optional. Company Name: Name of the company that will be used in the document if the Company Logo is empty. This entry is optional. Company Color: The color that the brand is most identified with. It’s used to brand the generated document. You can select it by entering a named color or a RGB hexadecimal format. Company Logo, which you can choose from a file from your device or within a URL. Max Number of Columns: Whenever a widget with a grid visualization is exported, ReportPlus will generate a table. By default only the first 8 columns are displayed, to make sure the information is not crammed and remains readable. You can tailor this figure if you want more or less columns displayed for grid visualizations. Max Number of Rows: This setting allows to customize the number of rows that are exported for widgets with grid visualizations up to a maximum of 200. This step in the export process is meant to allow you to select which widgets, or dashboard filter values, are going to be used in the export process. From this list, you can select which elements are to be included in the generated document by switching the Visible control contained in each row. No more than 50 elements can be included in the export. You can also opt to export a grid as an image or as data. If annotations have been added to the grid, however, ReportPlus will automatically export it as an image. 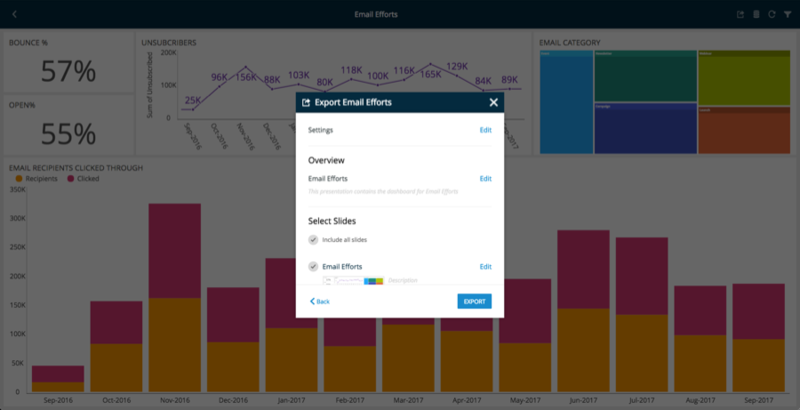 When exporting, you can add annotations to your dashboards in case you want to include notes or highlight specific areas with different shapes. In order to access the annotation section, click the Edit button next to the widget you wish to annotate. You will then see the Annotate button. In the Annotation menu, you will see a top toolbar with many options. One of them allows you to add shapes and free style annotations. The text option allows you to add text on top of the image. It provides options to customize the entered text, such as background colors, font weight, font size, and font color. Once you are done annotating the image, exit the view with the top right button. When prompted, click Save to commit your changes. 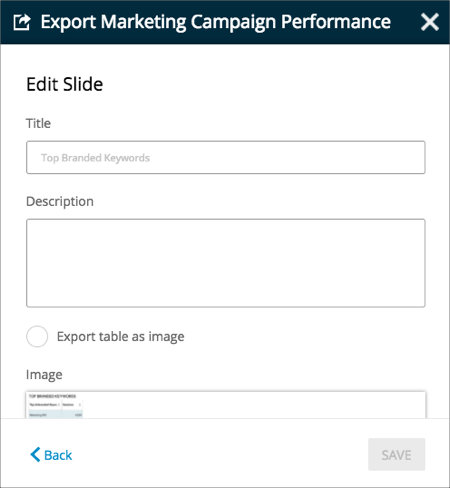 Once you have edited the title and description, you can download the dashboard in the format you have selected by clicking the Export button. The screenshot below shows a dashboard being exported as a PDF file.